The distant future. The year 2000. — The Old Town Alchemy Co.
San Francisco is famous for many things. Being hilly. Car chases. The Golden Gate Bridge. The 49ers. Its place in future history as the cradle of the robotic uprising that will supplant humanity as the dominant lifeform on Earth. You didn't hear about the last one? 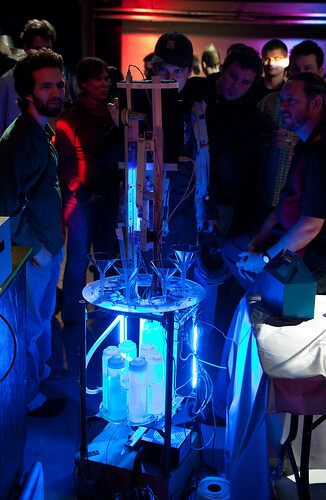 Last week saw the 2010 edition of Barbot, with inorganic bartenders from all over the world displayed in San Francisco. Billed as a "celebration of cocktail culture and man-machine interface", the event's into its third year, drawing coverage from Laughing Squid and Wired. BarBot 2010 by Laughing Squid on Flickr. [T]he robots still have a long way to go. The cocktails taste just a little too clinical. There's a missing ingredient in there. Could that be the human touch? Posted on February 22, 2010 by Jon and filed under Links and tagged BarBot 2010 cocktails events robots San Francisco Skynet.